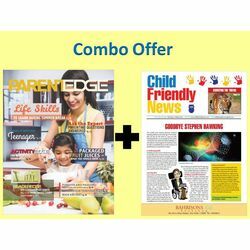 ParentEdge is a bi-monthly magazine for discerning Indian parents who care deeply about their children's education, intellectual enrichment and stimulation. The magazine’s premise is that learning is a continuous process, and needs to happen both in and outside of school; thus parents have an important role to play in shaping their children’s interests and intellect. ParentEdge will primarily cater to the needs of parents of school going children from ages 3 to 18. The magazine aims to help parents adapt from the latest trends in learning across the world to their context, gain exposure to the growing choices before today’s children, as well as develop a more holistic view on moulding their children’s futures. Progressive parents will find a wealth of information in the magazine to help them steer their children towards well-rounded life perspectives as they grow. Many features are designed to be shared with children. Readers can look forward to thought provoking articles that combine professional advice from experts, insights from contemporary research, and personal anecdotes from fellow parents as well as viewpoints from children. ParentEdge is a bi-monthly magazine for discerning Indian parents who care deeply about their children's education, intellectual enrichment and stimulation. The magazine’s premise is that learning is a continuous process, and needs to happen both in and outside of school; thus parents have an important role to play in shaping their children’s interests and intellect. ParentEdge will primarily cater to the needs of parents of school going children from ages 3 to 18. The magazine aims to help parents adapt from the latest trends in learning across the world to their context, gain exposure to the growing choices before today’s children, as well as develop a more holistic view on moulding their children’s futures. Progressive parents will find a wealth of information in the magazine to help them steer their children towards well-rounded life perspectives as they grow. Many features are designed to be shared with children. Readers can look forward to thought provoking articles that combine professional advice from experts, insights from contemporary research, and personal anecdotes from fellow parents as well as viewpoints from children.